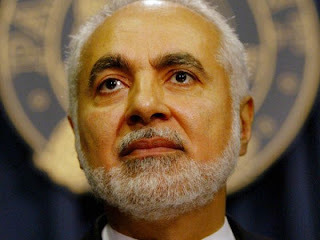 Newly discovered statements by Imam Feisal Abdul Rauf, the man behind the Ground Zero mosque project, show he supports the destruction of Israel. His supporters may hold him up as a moderate, but he has spoken out in favor of a "one-state solution" to the Israeli-Palestinian conflict and he sees peace agreements with Israel as a means to that end. "And I personally — my own personal analysis tells me that a one-state solution is a more coherent one than a two-state solution," Imam Rauf told an audience in July 2005. The phrase "one-state solution" is often used by Islamic extremists to advocate the destruction of Israel, especially by those parading as moderates. It is said with the knowledge that any "one-state solution" would result in the Jews being outnumbered in their own land, replacing Israel with a Muslim state called Palestine. A letter to the editor written by Imam Rauf on November 27, 1977 puts to rest any doubt that Rauf could have been misinterpreted. In it, he wrote that he supports Egypt's peace treaty with Israel, but only because it would ultimately bring victory over Israel. He reminds Muslims that Muhammad received similar resistance to his own peace treaty with their enemies but "peace turned out to be a most effective weapon against the unbeliever." "Muhammad used that period to consolidate his ranks and re-arm, eventually leading to his conquest of Mecca. Imam Rauf seems to be saying that Muslims should understand Sadat's olive branch in the same way, as a short-term respite to ultimate conquest," explained the Wall Street Journal in its breaking of the story. Imam Rauf stated that there will not be peace until Israel ceases to exist. He says that Israel is destined to collapse and "In a true peace, Israel will, in our lifetimes, become one more Arab country, with a Jewish minority." To this day, Rauf has not said that Israel has a right to exist and has chosen to work with those dedicated to the country's elimination. He has refused to condemn Hamas as a terrorist group, saying "I am a peace builder. I will not allow anybody to put me in a position where I am seen by any party in the world as an adversary or as an enemy." He has also involved himself with the Muslim Brotherhood, the parent organization of Hamas that is dedicated to destroying Israel and bringing the world under Shariah Law. Dr. Zuhdi Jasser, the founder of the American-Islamic Forum for Democracy, opposes Imam Rauf's project partially because of his reluctance to confront the Muslim Brotherhood. He points out that Rauf describes top Brotherhood theologian Sheikh Yousef al-Qaradawi as a "moderate" in his book despite his history of anti-Semitism, endorsement of suicide bombings and Hamas, support for the killing if U.S. soldiers in Muslim lands, and calls for Muslims to wage jihad against Israel until it's destroyed. "You now lecture Americans that WTC mosque protests are 'politically motivated' and 'go against the American principle of church and state.' Yet you ignore the wide global prevalence of far more dangerous theo-political groups like the Muslim Brotherhood and all of its violent and nonviolent offshoots," Jasser writes. The Center for Security Policy's Christine Brim revealed that Rauf's Cordoba Institute had deleted websites about its Shariah Index Project to rate the compliance of each country with Islamic law. The websites described how individuals affiliated with the Muslim Brotherhood had been involved, with the International Institute for Islamic Thought (IIIT) playing a particularly close role. The IIIT is listed in the Muslim Brotherhood's own documents as one of its fronts and its Vice President, Jamal Barzinji, chaired one meeting in November 2008 where Rauf's book was officially released.